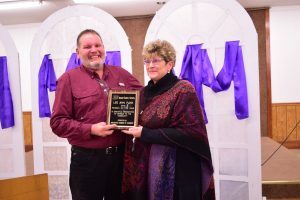 Lee Ann Funk was chosen as a 2018 Chamber Person of the Year for her service to many volunteer organizations in Mascoutah. Of special note is her dedication and service to the Mascoutah Chamber of Commerce. Lee Ann Serves as the volunteer manager of the Mascoutah Visitor’s Center. The Chamber thanks Lee Ann for her service. The Award is given for volunteer service and not be part of any job or occupation. The award was presented by 2017 winner Kenny Kehrer.